'The Shop' can be the TV equivalent to The Player's Tribune. Professional athletes are not comic book superheroes who exist simply for our amusement. Money and fame have created an ever increasing gulf between them and common folk. LeBron James’s The Shop, which made its debut on HBO last night, is his effort to bridge that divide. It’s an attempt to highlight star athletes as multidimensional people with real thoughts, feelings, concerns and fears. The Shop is not a conventional talk show. There is no studio audience. The guests aren’t there to sell a movie or pitch products. The Shop is a free flowing, unfiltered discussion set in a barbershop. 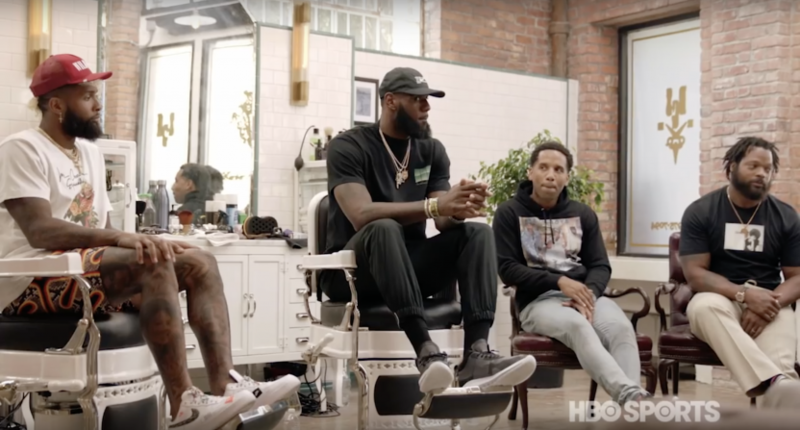 The first episode featured LeBron surrounded by New York Giants wide receiver Odell Beckham Jr., Golden State Warriors forward Draymond Green, Los Angeles Sparks star Candace Parker and Philadelphia Eagles defensive lineman Michael Bennett among others. It also included non-sports luminaries like comedian Jon Stewart and rapper Snoop Dogg. It’s a very black show (Stewart was the lone guest who was not a person of color). It’s also the kind of show LeBron can do on HBO, free of the entanglements and limitations that would have existed at say, ESPN (LeBron drops F-bombs!). But LeBron’s intent isn’t to push the limits on language but to advance conversations that are important to him – race, fatherhood, and the challenges of celebrity. LeBron might be the most well-adjusted prodigy we’ve ever seen. He’s been famous ever since he appeared on the cover of Sports Illustrated in February 2002 as “The Chosen One.” He was 17-years-old then. LeBron is 33 now. And despite having a nonstop spotlight following him around his entire adult life, he has been an exemplary role model and person. He’s a champion. He’s charitable. He’s outspoken. The Shop is LeBron speaking his mind in a new format. In some ways, this is the TV equivalent of Derek Jeter’s The Players’ Tribune. The Players Tribune has become one the top platforms for athletes to get their message out outside of the mainstream media. The Shop may serve a similar purpose as a safe space for athletes and others to talk. At a time when trust in the media is low, athletes may grow more and more comfortable sharing their stories on The Shop. Kind of like The Players Tribune, whether it’s Kevin Love penning an essay about mental health or Andrew McCutchen writing on baseball and poverty. Beckham obviously felt more comfortable sharing that interaction with people whom he considers his peers. Most traditional media members have no idea what that’s like. At The Shop, Beckham doesn’t have to worry about being misinterpreted or taken out of context. These are his words, his feelings. That’s probably liberating and appealing for many athletes. As a television show, The Shop is a work in progress. The debut seemed disjointed at times. There are a lot of people talking in a 30-minute episode and it occasionally feels like verbal ping-pong. Perhaps a streamlined approach would be more effective? (Fewer guests?) Stewart’s presence was an interesting addition. As someone who had his own highly successful show, Stewart helped smooth out some of rough patches and provided some valuable insight. It would be great if he’s a regular on The Shop. There are kinks to be ironed out. That’s not unusual. It takes time for any show to find its right voice and footing. We can’t and shouldn’t expect a polished product from the start. When LeBron made the decision to sign with the L.A. Lakers over the summer, it seemed like more than a basketball move. The Lakers’ young core doesn’t seem ready to win an NBA championship any time soon. However, being in L.A. puts LeBron in contact with people in the entertainment industry. He is already crafting the next stage of his post-basketball life. It will be interesting to see LeBron’s long-term goal for The Shop. It’s possible as the show evolves that it will look different from what we saw this week. But so far, The Shop is off to a promising start. Born in Jamaica. Grew up in New York City. Lives in Louisville, Ky. Sports writer. Not related to Ulysses S. Grant, Anthony Grant, Amy Grant or Hugh Grant.